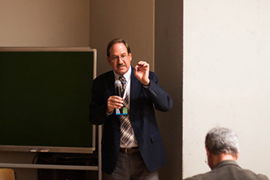 The International Centre for Integrated Mountain Development (ICIMOD), the Mountain Partnership Secretariat (MPS), and the Food and Agriculture Organization (FAO) with support from the World Bank organized a session on ‘Building Climate Change Resilience in Mountains’ at the Global Landscapes Forum on 16 November 2013. The two-day forum was organized on the sidelines of the 19th session of the Conference of Parties (COP19) of the UN Framework Convention on Climate Change (UNFCCC) in Warsaw, Poland. 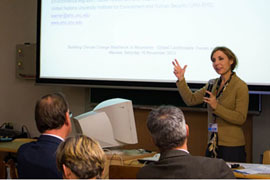 Over 60 people comprising scientists, COP19 delegates, and development professionals attended the forum. The forum panelists noted the need for resilience planning to complement national disaster risk reduction programmes, underscoring the frequency of natural disasters in mountain regions. Others highlighted that impacts on mountain areas have generally been insufficiently considered under National Adaptation Programmes of Action (NAPAs) and that rainfall and water availability remain among the largest challenges facing mountain communities in the context of climate change. Several panelists also recommended diversifying livelihood options for mountain communities to make them less vulnerable to climate change. 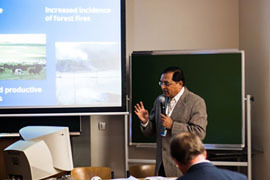 Dr Eklabya Sharma, ICIMOD’s Director Programme Operations, who served as a panelist at the session, said resilience planning is needed at local and regional levels to complement national disaster risk reduction programmes. He noted that 76 natural disasters that kill 36,000 people a year on average have been documented in the Hindu Kush Himalayan region. “Together with balancing development and conservation, promoting sustainable energy production, alleviating poverty and limiting out-migration, reducing the impact of natural disasters can create climate change resilience in mountain areas,” he said. Mr Hanta Rabetaliana, President of the Malagasy World Mountain People Association; Mr Keith Alverson, Head of the Climate Change Adaptation and Terrestrial Ecosystems Branch, United Nations Environment Programme (UNEP); Eduardo Durand, Director of Climate Change of the Ministry of Environment of Peru; Eduardo Rojas-Briales, Assistant Director General of the Forestry Department of the Food and Agriculture Organization of the United Nations; and Koko Warner, United Nations University Institute for Environment and Human Security also discussed specific challenges climate change poses to mountain communities in the session moderated by Thomas Hofer, Coordinator of the Mountain Partnership Secretariat. The panelists and participants concluded that local community empowerment is essential to building climate change resilience in mountains. 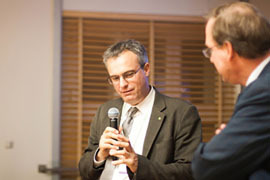 The Global Landscapes Forum advocates the ‘landscape approach’ to rural development as a way to bring together the agricultural, forestry, energy and fisheries sectors to come up with collaborative and innovative solutions to ease increasing pressure on the world’s resources threatened by climate change.